After a pretty late night following welcoming in the new year I thought I may have trouble waking up on the first day of 2012. However, I found myself wide awake long before my alarm was due to go off. Why? 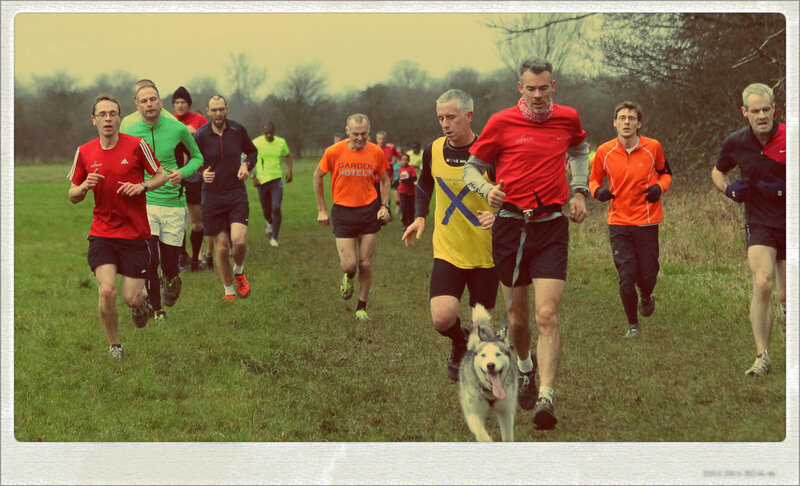 It was a special day in the parkrun world.. I left the house with my brother-in-law (who had his camera in hand - thank you for the photos) and headed towards Croydon, but today as we reached Whyteleafe instead of taking the road to Riddlesdown we continued along the A22/A23 until we reached Roundshaw Downs. We were quite early and had plenty of time to chat to some of the volunteers. This parkrun uses the 'facilities' of the adjacent gym, but because it was closed I had to search to find a secluded area to... you know... water the flowers. Roundshaw Downs is pretty open so stumbled through some of the bushes at the edge of the course. I had to negotiate quite a slippery descent to reach my destination and ended up flat on my backside sliding down towards some kind of spiky tree-like thing. Unimpressed at my lack of traction I continued my business before returning to the registration area for a little warm-up. Soon after, the runners were summonsed to the start line. The race director was well aware that a few of the runners were taking part in the parkrun special and got us under way at 10am sharp! The course works its way around the edge of the downs before cutting across, where you reach the high ground. I was busy concentrating on breathing and not falling over, so almost completely missed the absolutely stunning view you get from the top of the course. Next up was the mini-trail section, I liked this part a lot - it is a shame that it is so short. After that the ground got a lot muddier, but not for long. Then the course takes you along a bit further before you swoop back down towards the registration area and you start lap two. 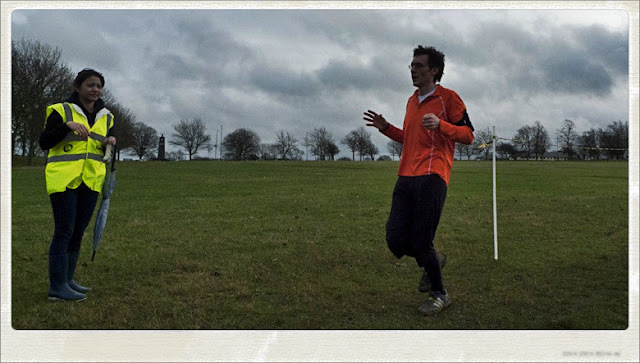 At the end of the second lap I resisted the temptation to sprint like a maniac down the final straight, crossed the finish line, took my position barcode, got everything scanned and ran back to the car to move on to part two of my running day. After a quick change of shoes (my trail shoes were in no state to be going anywhere other than on their special newspaper in the boot of the car) we were back on the road.. the road to Riddlesdown. There had been some worry that I may not make it to Riddlesdown in time for the start of my second parkrun of the day. However, we arrived at Warlingham School with bags if time to spare. 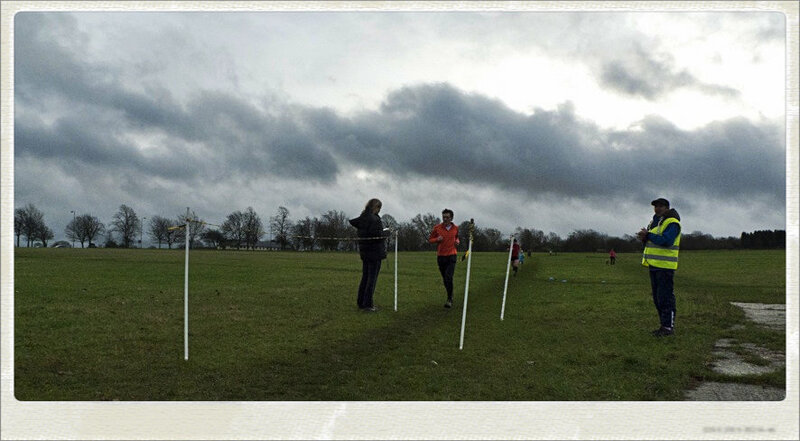 With plenty of runners coming from all over South London to complete their double or triple parkrun special, Nicki (race director) quite sensibly delayed the start by fifteen minutes. While waiting at the start line someone came out of a crowd of people and asked if I was copy7t. 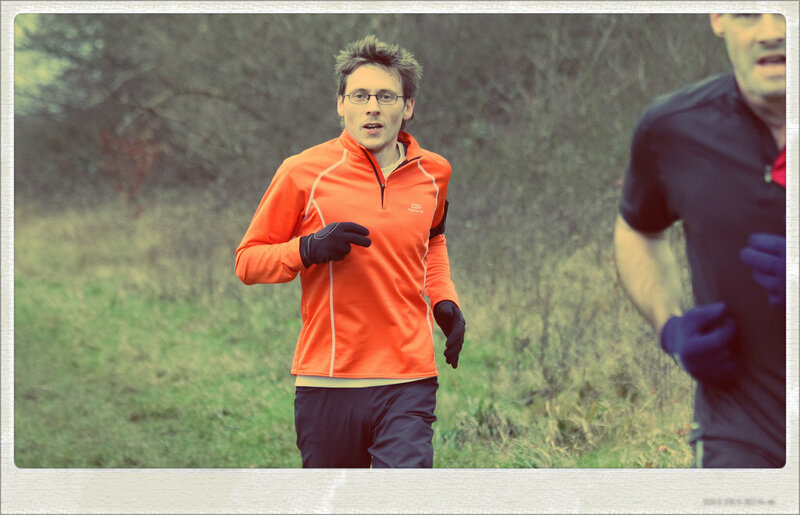 It was fellow parkrunner and janathoner, abradypus! 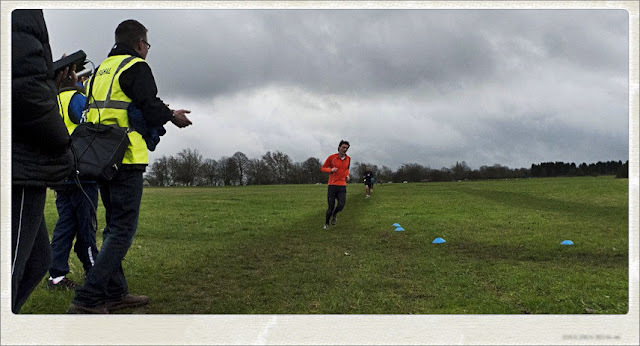 She had already run at Bushy parkrun that morning, which started at 9am, and was completing her New Years Day double on her second visit to Riddlesdown. Nicki sent all 176 of us on our way at 11:15. I spotted a few of parkrun's celebrities, including the parkrun founder, Paul Sinton-Hewitt (marking his 100th parkrun) and one of the parkrun show presenters, Danny Norman. 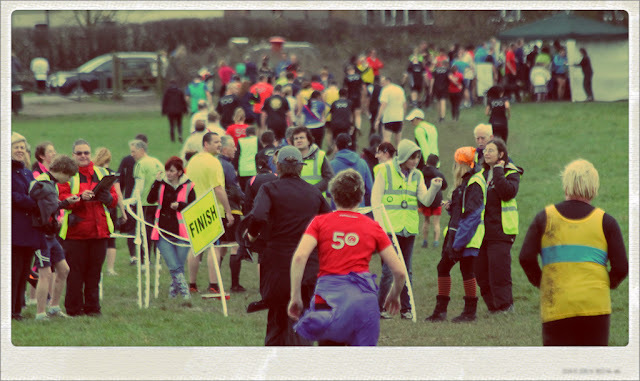 The course was in pretty much the same state as on the previous day - muddy and slippery. 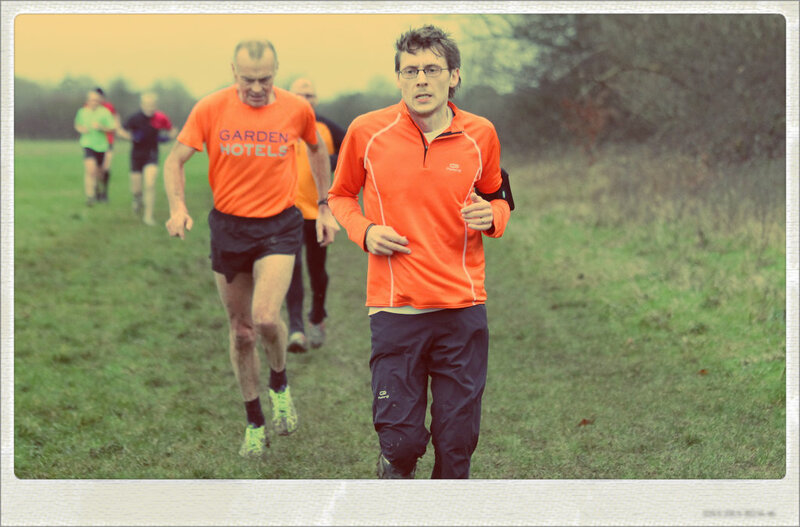 After a while I found myself side-by-side with another regular Riddlesdown runner, Mark. We stayed like this for the rest of the run, every now and then a little surge took place that was instantly matched by the other runner. Then I heard someone breathing behind me, a while later someone shouted 'go Gerry!' 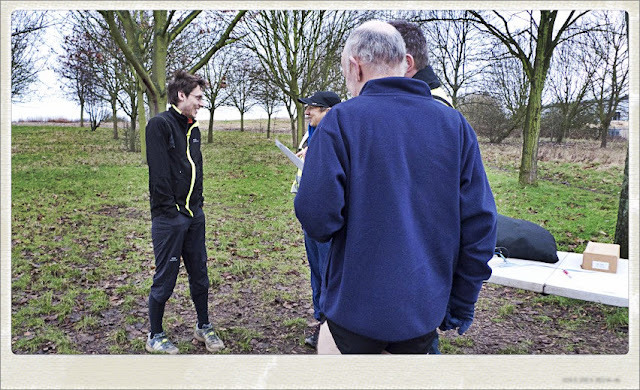 - It was the same runner that I had on my tail many months ago, at event number 2 and here we were again in the same position. During the second lap I almost took a tumble as I found myself on the inside lane on the approach the sharp right-hander before the incline to Condon corner. As I hit the corner I had no traction and just kept going straight ahead. Luckily I regained my footing and continued. As we neared the final straight Gerry was still behind me and I was expecting him to overtake me, but as we entered the final straight I managed to stay in front of him. I could easily have got involved in a sprint with Mark but I resisted the opportunity to do so and he came in one second in front of me. With the running out of the way we moved on to the Good Companions pub for Mrs7t's birthday celebrations with our parkrun family... When I get around to it I will write about it on my other blog - papa7t.